Connect all care team members and drive action through one cloud-based platform. "Having access to the care plan and your support while our child was in the ER was invaluable. You're our guardian angel." Just the facts about ACT.md, our platform, and our approach to care redesign with clinical, payer, and community organizations across the country. We know this is top of mind for you. It’s top of mind for us, too. ACT.md is purpose-built for healthcare with industry-leading cloud security. We’ve attested to information, privacy and security standards with national payers and academic medical centers. Designed for ease of use across the whole care team - enabling high-quality care rather than getting in the way of it. Using ACT.md feels familiar and requires little to no training, because it’s built like many of the apps we all use in our everyday lives. Security meets innovation. We’ve solved the problem of engaging those outside your organization who don’t want to join another platform. 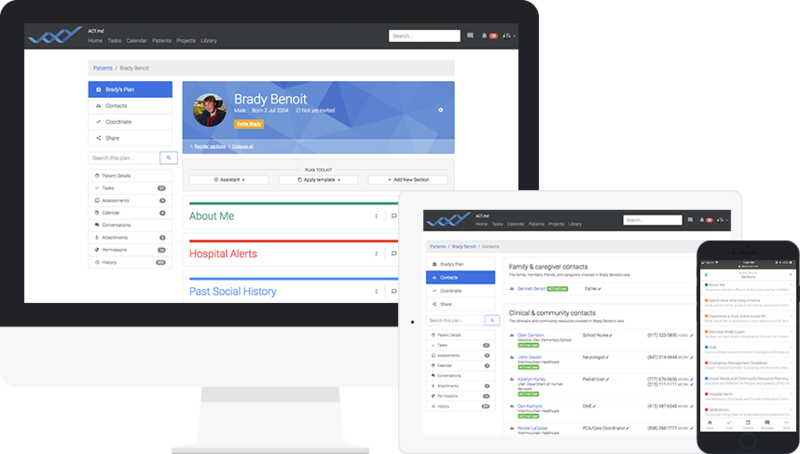 We’ve built features that let them participate in ACT.md care coordination without needing to log in.